I produce unique and original hand-painted Individual House Portraits using your own photographs. The paintings are finished with a simple white hidden box frame and are ready to hang. Please note - These are larger paintings and the price will be confirmed before any work commences - due to the size of these paintings they will need to be collected from my studio or a courier / parcel post amount will be agreed with you in advance. Please contact me and we will agree a price before I begin the painting. There is no up-front fee for my work. 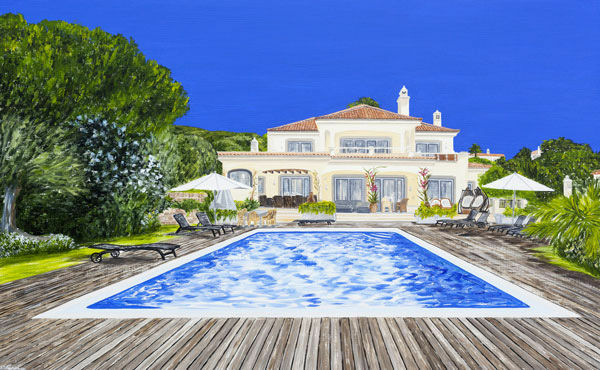 I am an acrylic painter and I specialise in creating an original and unique portrait painting of your home. I enjoy creating unique, hand-painted house portraits and I aim to capture a realistic likeness but also to create a painting for you to cherish. If you wish to commission a house portrait, please contact me in the first instance. Please e-mail me at alyson@artbyalysonsheldrake.com and send me one or more high resolution photographs before you place an order. We will discuss which picture works best for this painting and agree in advance the picture to use and I will advise you on the expected time scale for this work to be completed. Upon completion of the painting I will send you a photograph of the finished painting, and I can make slight adjustments if needed. Only once you are happy with the painting will I request the payment agreed. Upon receipt of payment I will then ship the item to you. The painting will be securely wrapped and packaged, and the cost of postage to Europe or the UK will be included in the price. If you are outside of this area for postage, please contact me for advice on any additional postage costs. If you do not have a digital image of the photo you want painted, you may send me your original photos and I will return them when the painting is completed. Please contact me for full address details.